Previously Labour MP for Glasgow Central. Entered Parliament on 6 May 2010 - General Election. He lost his seat in 2015 to SNP’s Alison Thewliss MP. He has served as MSP for Glasgow since May 2016. He was born and brought up in Glasgow. He studied at Glasgow University and prior to becoming an MP, he worked as an NHS dentist. Anas has been an active member of the Labour Party since the age of 16 and is a member of the Party's Scottish Policy Forum. Anas has been involved in a number of local campaigns, notably 'Carry a Knife, Go to Jail', which demands tougher measures on knife crime and 'A fairer deal for Glasgow', campaigning against the Glasgow Airport Rail link. Anas has also served as vice-chair of Progress, a Labour pressure group which aims to promote a radical and progressive politics for the 21st century. He is the founder and coordinator of Y-Vote, a new political platform for young people which uses a mix of music and political education to engage young people into the political process. Y-Vote held their first major event at the Carling Academy on March 29th 2007 which attracted an audience of almost 1,000 young people. Anas was recognized as a future political force at the YSME Awards held at the Scottish Parliament in 2008 and was named as the Scottish Sun's Best New Scottish Politician 2009 at the Scottish Variety Awards. 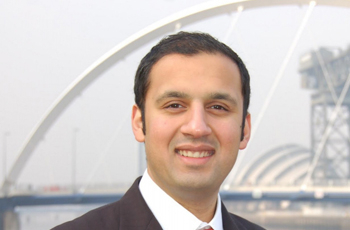 On the 10th September 2007 Anas was selected to be Labour's candidate for Glasgow Central, and secured his place as Glasgow Centrals representative in Parliament during the 2010 General Election with 52% of the popular vote, taking the seat formally held by his father Mohamed Sarwar. Anas was elected to serve on the House of Commons International Development Committee and the Committee on Arms Export Controls from 2010-2012. He was the deputy leader of the Scottish Labour Party between 2011 and 2014, acting as chief coordinator of Labour's 2014 Scottish referendum campaign. In 2017, he ran for leader of the Scottish Labour Party but lost to Richard Leonard MSP. He currently lives in Glasgow with his wife and two young sons.